Some of the buildings at ACC Rio Grande are more than 100 years old. The campus served as a middle and high school for decades. It was converted into a college in 1975. Exciting renovations are underway in the Main Building. Soon, there will be two enclosed courtyards, state-of-the-art classrooms, and the ACCelerator, an interactive learning hub that has been extremely successful at ACC’s Highland Campus. In the meantime, Building 3000 remains open for classes. You can take courses intended for university transfer or work toward a career-technical certification. ACC Rio Grande offers American Sign Language Interpreter Training and Human Services programs and classes. 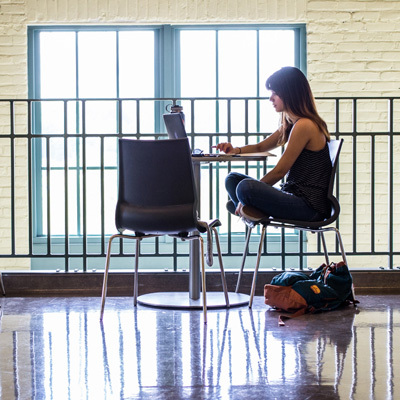 Students at ACC Rio Grande have access to academic advising, career counseling, financial aid, and free tutoring services. This is the perfect place to pursue your goals, whatever they may be. 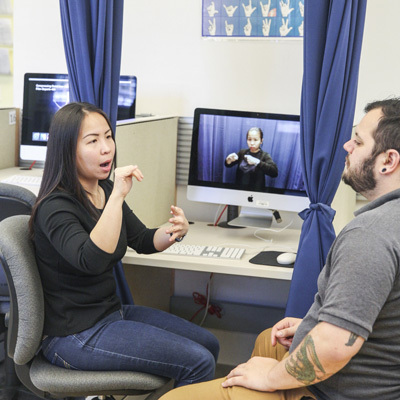 American Sign Language- Interpreter Training The campus is home to the American Sign Language-Interpreter Training Program and a gathering place for the college’s deaf community. 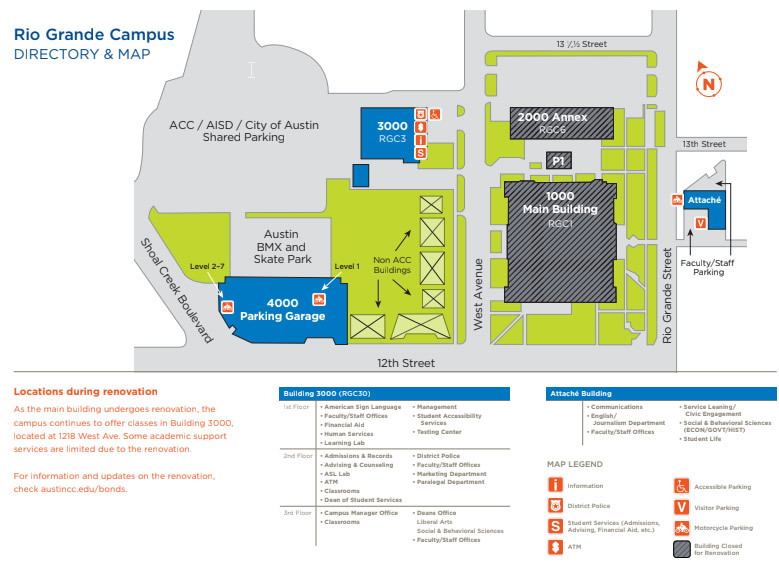 Building 3000 While ACC Rio Grande is closed for construction, classes and student services have relocated to Building 3000. Academic transfer The No. 1 college for transfers to UT and Texas State, ACC is an affordable route for core classes like history, math, and English. Turn right on 15th Street, go 0.9 miles. Turn left on Rio Grande Street, go 0.2 miles. to the Rio Grande Campus. Take Exit 235A toward MLK Blvd/State Capitol/15th Street. Turn left on 15th Street, go about 1 miles. Turn left on Rio Grande Street, go 0.2 miles. to the Rio Grande Campus. Turn left on 15th Street, go 0.3 miles. Turn right on Rio Grande Street, go 0.2 miles. to the Rio Grande Campus. Turn right on 15th Street, go 0.3 miles.